In the winter, there’s nothing cozier than a nice hot cup of cocoa. So what could be the better way to celebrate a winter holiday like Valentine’s Day than sharing a special cup of hot chocolate with someone you love? 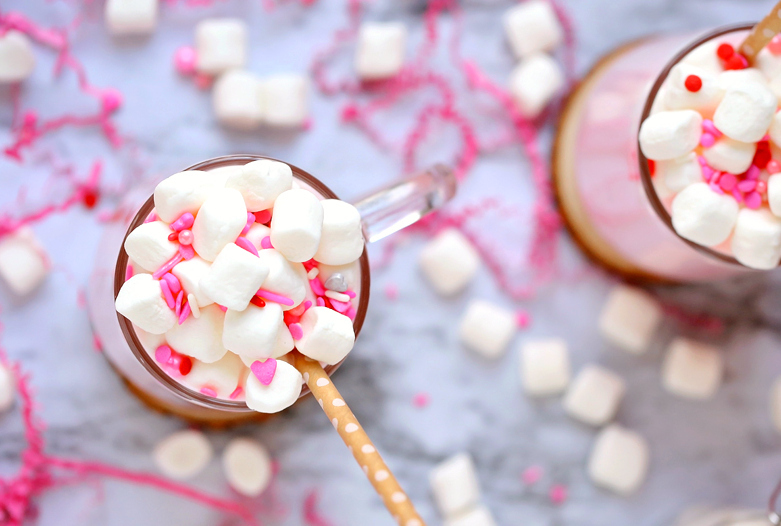 My Valentine’s Hot Cocoa is a simple twist on your basic hot chocolate recipe. 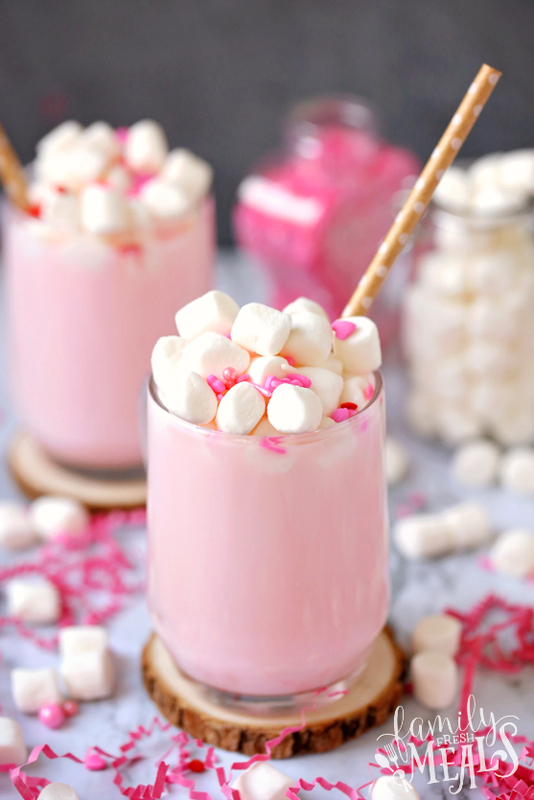 Instead of milk chocolate, you use white chocolate chips and pink candy melts, melted right into the hot milk. This makes a cheery pink cocoa that’s perfect for the holiday. 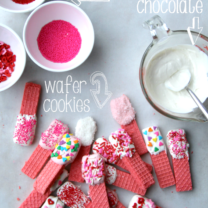 To make it extra special, top it with a handful of mini marshmallows and some festive pink sprinkles. 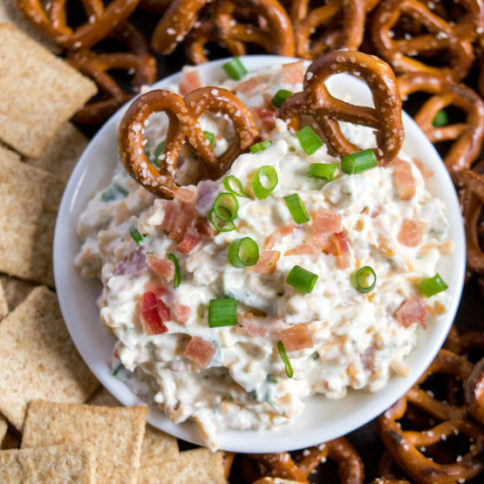 The only problem with this recipe is that you have to make it on the stove and then sit down and drink it right away, while it’s still hot. That makes it hard to share with someone you love who lives some distance away. For those folks, I’ve got a second twist on cocoa: An Easy DIY Hot Cocoa Giftable. It’s basically a hot chocolate kit in a bag: dry cocoa mix, mini marshmallows, and sprinkles. 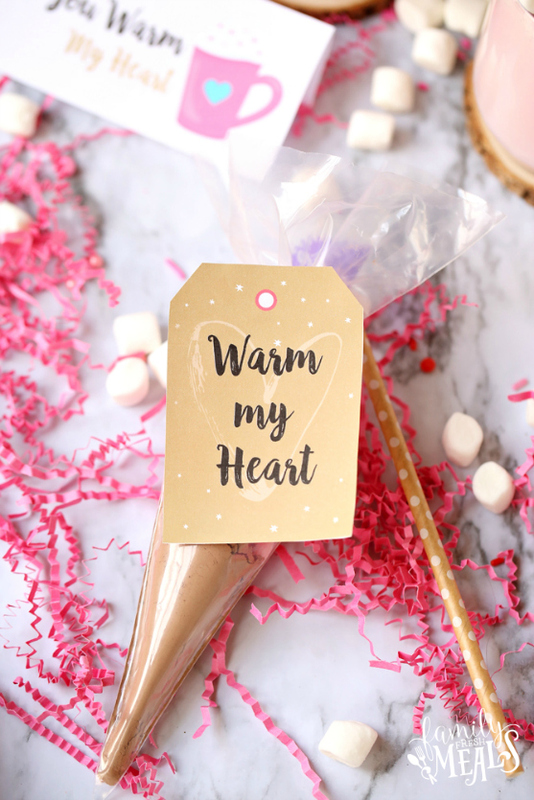 Tie it all up with a ribbon and one of my printable gift tags for a simple, tasty Valentine that shows your friends how special they are to you. 1. 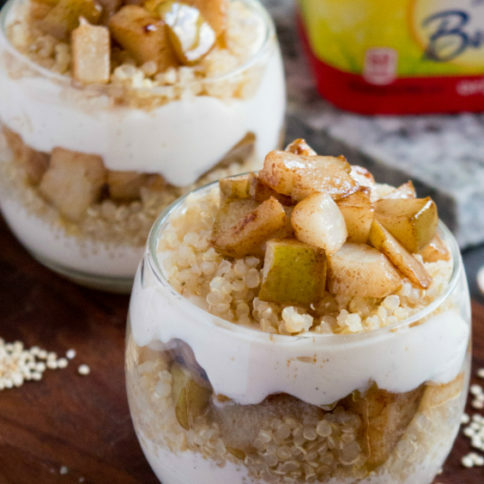 Over a medium low heat, combine milk, white chocolate chips, and candy melts in a pot. Stirring frequently, until chocolate is melted. 2. Pour into 2 mugs, and top with a hand full of marshmallows + festive sprinkles. 1. 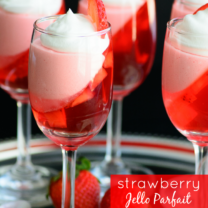 To create your gift, set your piping bag in a tall narrow glass, and fold the outer end over the lip to securely hold. 2. Pour cocoa powder into your piping bag, then top with mini marshmallows and sprinkles. 3. Tie a string or ribbon around your bag just above where your marshmallows rest, and cut off any excessive length (make sure to leave around 2 inches up top). 4. Attach your gift tag when tying your string or tape it onto the front of your bag. Gift alone or inside a cute mug! 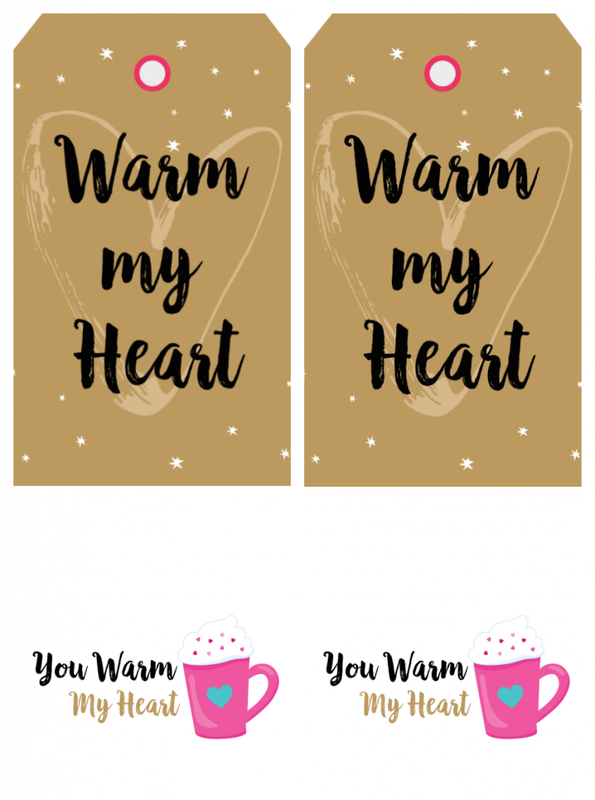 Click HERE for printable PDF version of the gift tags. 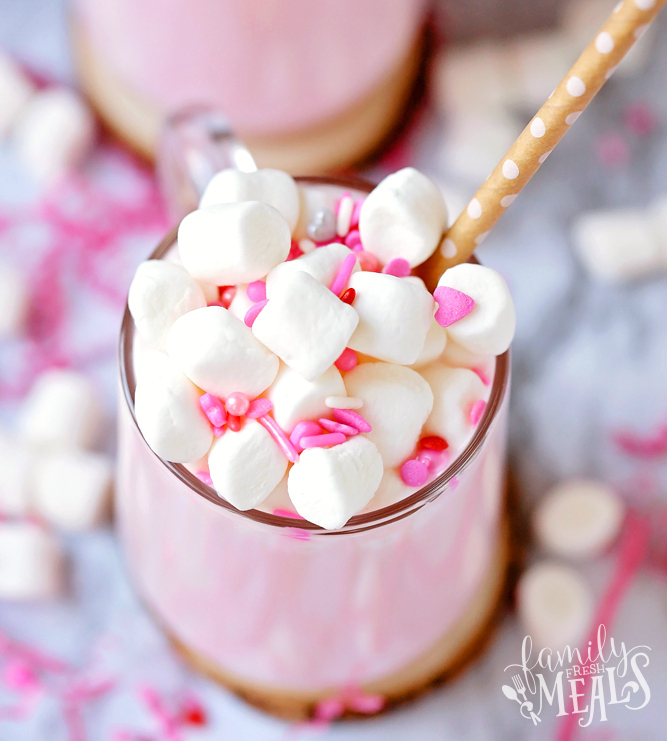 My Valentine's Pink Hot Cocoa with Free DIY Gift Tags makes a cheery pink cocoa that’s perfect for the holiday. 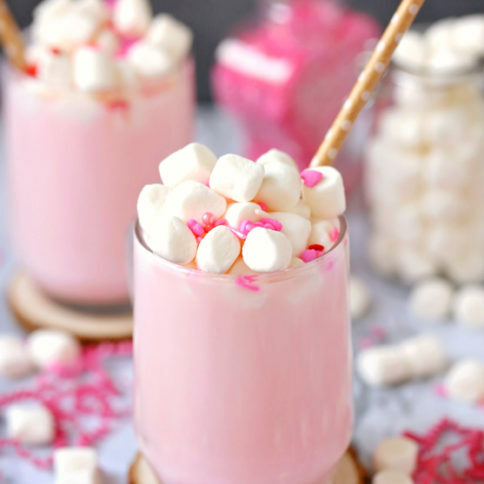 To make it extra special, top it with a handful of mini marshmallows and some festive pink sprinkles. Over a medium low heat, combine milk, white chocolate chips, and candy melts in a pot. Stirring frequently, until chocolate is melted. Pour into 2 mugs, and top with a hand full of marshmallows + festive sprinkles. 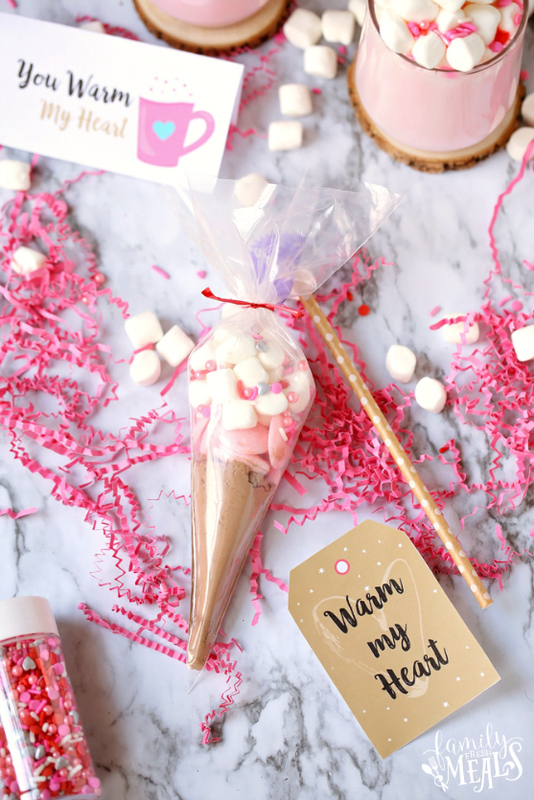 Your gift bag photos show the pink candy melts in the bag, but your recipe doesn’t mention them. 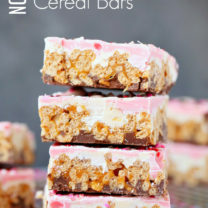 Can you share the recipe with the candy melts? I buy the pink candy at our local store TL. You don’t need to include those in the gift bag if you cannot find them. The pink melts are only required for the top Pink Cocoa recipe. I love giftables like this and the print tag makes it over the top. Thank you!